The Paydirt Mining Company has GOLD for sale! There is nothing like the beautiful luster and gleam of freshly mined placer GOLD, and now you can buy raw placer GOLD through the Arizona Association of Gold Prospectors and leave the digging to us. GOLD, while not very easy to find, is present in it's natural form throughout the world. Lode GOLD was eroded from quartz veins and carried down mountain slopes by rapidly moving rivers and streams. When these streams slowed down or leveled out, the GOLD dropped to the bottom of the streambed and formed "placer" deposits. Prospectors have often made great fortunes from sluicing, dredging, highbanking, drywashing and panning GOLD from these deposits. The placer GOLD you are able to purchase here was recovered from "placers" at The Golden Cross Mine located near Wickenburg and Morristown Arizona, and are guaranteed to be authentic. This GOLD typically runs 88-95% pure which is about 21-23karat, so you are getting more "real" GOLD. If you have been prospecting and searching the web for a place to buy GOLD and finding it difficult to do, you have found an answer and you can purchase GOLD in various amounts. See the examples above, pick the type(s) and size(s) you want to buy and either pay for immediately with a credit card or e-check or print out the order form and mail with proper payment! Any of these make a great unique gift for a birthday or Christmas, or if you are buying a gift for an employee, boss or friend! Remember, your orders help to keep our miners in the grand canyon state working! Please note, during the hot summer months we are not able to conduct mining production so orders during this time and any other time that production is limited may be filled with placer GOLD from other sources. All GOLD orders below are only for shipments going to addresses in the United States, no other countries! Purchase GOLD by the Pouch! GOLD pouches come in three sizes. You can purchase pouches in a $20, $30 or $50 size. Examples of The $20 and $30 can be seen above with the $50 with almost twice as much as the $30 pouch. The $50 pouch will contain more and larger pieces of GOLD. Purchase GOLD by the Vial! If you are interested in purchasing GOLD Nuggets, view the examples above and order in the following price range(s). Nuggets can be ordered for $10 a piece and up in $5 increments. Nuggets shown range from $10 to $80. If you want a more expensive Nugget than those shown, e-mail your request along with any particulars. If a matching Nugget is found, you will be e-mailed back about availability and the price. Purchase GOLD On a Weekly or Monthly Basis! If you are interested in purchasing GOLD as a long-term investment then we have just the answer for you. Now you can have a a mixed lot of GOLD sent to you each and every week or month by simply clicking on the appropriate selection below. 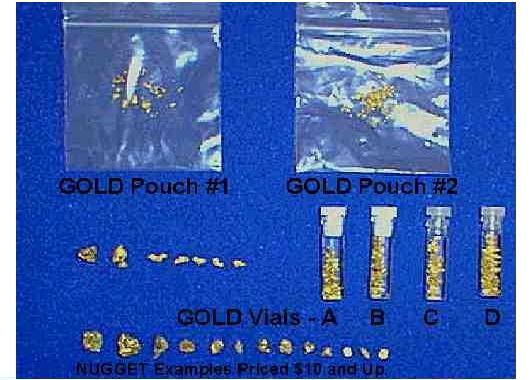 We will automatically ship you a $25, $50 or $100 pouch of GOLD made up of both small placer GOLD and Nuggets. There's no better way to assure your future than to invest in GOLD on a regular basis. Shipping and handling is still discounted to only $6.00 - $8.00 per shipment and charged with each weekly or monthly subscription. Start and stop at any time with no long-term commitment required to participate. You may halt your subscription online or just let us know when you want your orders to stop and we will be happy to end the subscription for you until you are ready to start again. All GOLD orders are shipped via USPS Mail with delivery confirmation tracking to assure you prompt and safe delivery. Yes, I want some Arizona placer GOLD! $10 GOLD pouch X _____ = ______ dollars. $20 GOLD pouch X _____ = ______ dollars. $10 GOLD vials X _____ = ______ dollars. $15 GOLD vials X _____ = ______ dollars. $20 GOLD vials X _____ = ______ dollars. $25 GOLD vials X _____ = ______ dollars. $10 NUGGET(S) X _____ = ______ dollars. $15 NUGGET(S) X _____ = ______ dollars. $20 NUGGET(S) X _____ = ______ dollars. $25 NUGGET(S) X _____ = ______ dollars. $__ NUGGET(S) X _____ = ______ dollars. The total GOLD order is = ______ U.S. dollars. Please add $6.00 shipping and handling for the first order through $49.99, $10 for $50-$99.99, $15 for $100.00-$149.99 and $20 for $150.00 and up. Please add $5 if you want your order insured and please note this on your order. We are not responsible for orders lost in shipping. All orders are shipped via U.S.P.S. Mail with tracking. Total amount of order, including shipping and handling is $______ U.S. dollars. Please note, as we are dealing with GOLD, a highly volatile and subjective commodity, and we must consider all sales final! If you pay for your GOLD order via Google Checkout with a major credit card or bank check your shipping address must be verified as the same billing address for your credit card or bank account or your order cannot be shipped! USER AGREEMENT: Any orders cancelled prior to shipment will incur a 10% fee of the total sale for our trouble. We do promise to make every effort to assure your happiness and promote continued future orders!